There is much profound Taoist philosophy in a cup of tea, Taoists, who were called immortals, paid great attention to preserving their health. They believed that tea could ensure good health and a long life. (The immortals deified the Taoist ideas, and called them Taoism. ) Tea connoisseurs reflected Taoist thought in tea ceremony, and freed themselves from depression. Taoist tea ceremony has assimilated that a person is a small world, and a cup of tea reflects the sea…Tea is the cream of nature, and people can learn about natural changes through brewing and drinking tea, connoisseurs regarded tea as the cleanest and most beautiful thing in nature, so people should integrate themselves with nature while drinking it. Tea was discovered accidentally 3000 B.C. BY Shen Nong, the Divine Cultivator. One day leaves of tea plant fell into water he was boiling outdoors. He liked the drink, found it to have medicinal value, and tea was born. In the Tang dynasty (618-907), tea became an art. One of China’s golden ages, this was also the golden age of tea drinking, often done with elaborate ritual. Picking tribute tea became a festival in early spring, with thousands of young women gathering early in the morning on the mountains. In some areas, local people invite monks to burn incense and recite scriptures before picking. Sichuan province, possibly the birthplace of tea drinking, is famous for its teahouses. Villages in rural China usually don’t have teahouses, but every market or county town has one or more. Historically the teahouse was a center of social life for the men, as it remains in rural areas today. It is the place to exchange news, meet and talk with friends. Business deals of all kinds are concluded there. In some areas even the phrase shang cheguanr; literally “to go to the teahouse,” also means to take a dispute to be settled. Traditionally, tea plants were grown from seeds the size of hazelnuts, gathered in October and kept over the winter in a mixture of sand and earth. With this method, in spring they are sown either in a nursery area or directly into the field, about four feet apart. After two years the plants, now five to six feet tall, are cut back to about one foot. They are allowed to grow a bit, and after that are pruned weekly to keep them waist high. Plucking can begin at three years, or at five in high altitudes. A bush can produce fo thirty or forty years. 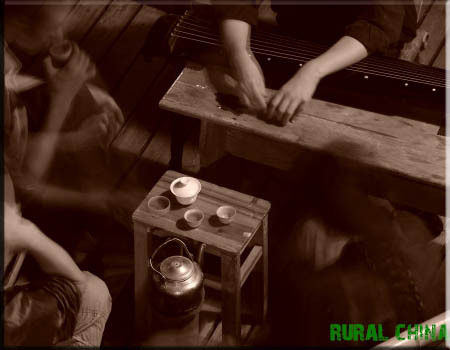 Rural China organises “Tea Tour” around China’s prime tea growing mountains, for inquiries please contact us directly.